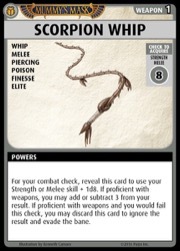 Like scourges, triggers, and traders, precision is one of the subthemes of the Mummy's Mask Adventure Path for the Pathfinder Adventure Card Game. This topic doesn't get as much attention because it's not quite as flashy, but we like it because it's a different type of challenge. In this blog, I'll let you know where the idea came from and how it ended up. 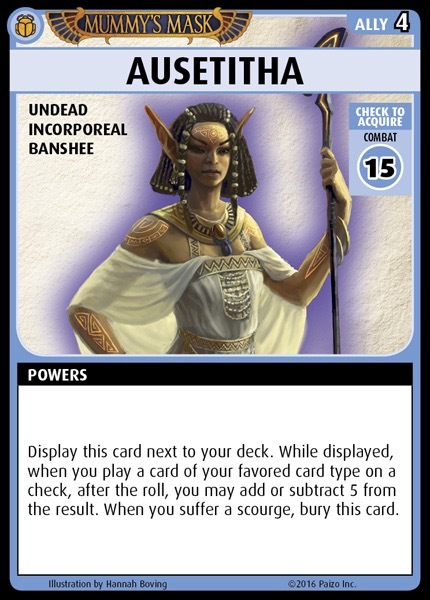 Early on, Lone Shark designers Gaby, Paul, and Liz locked in on a key feature of the Pathfinder RPG version of the Mummy's Mask Adventure Path. Right at the start of the the first volume, you participate in a lottery to win the right to explore and effectively loot tombs in the Osirian city of Wati. 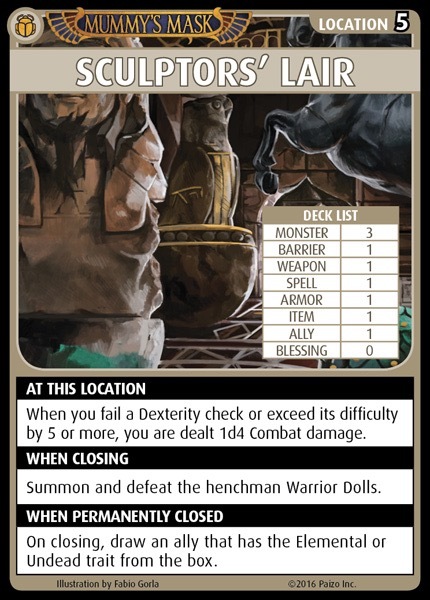 The priests of the Grand Mausoleum have a set of three rules that restrict how much collateral damage your adventuring can inflict. 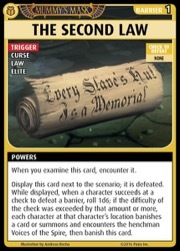 "Remember How This Came to Pass" is a reminder that the necropolis remains a holy place. "Every Slave's Hut Is a Memorial" instructs explorers that willful and unnecessary destruction of tombs will not be tolerated. "Honor the Departed" requires that the dead be treated with respect. 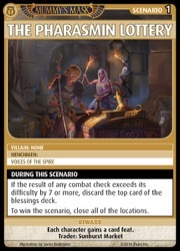 These rules are enforced by a militant group within the church of Pharasma known as the Voices of the Spire. 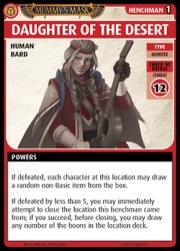 We modeled that in a simple mechanic: If you achieve too high a number in your roll to defeat a bane or acquire a boon, you break something you shouldn't. 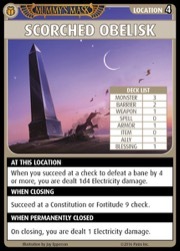 This makes the Voices of the Spire angry, and they wail on your heads for it. There are places you should also tread carefully. 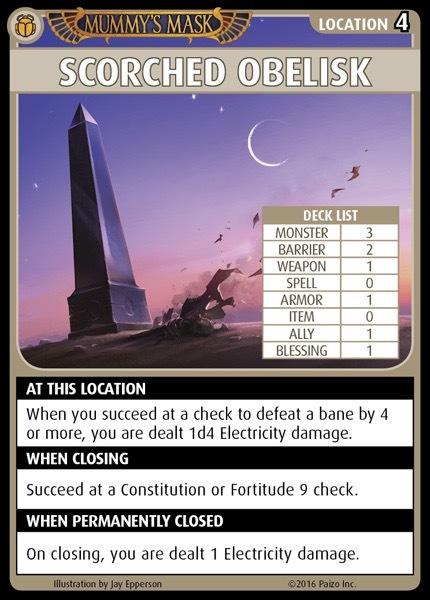 The Scorched Obelisk is a jittery lightning magnet. The Alchemical Laboratory is filled with fragile flasks of acid, so watch where you swing that greatclub. 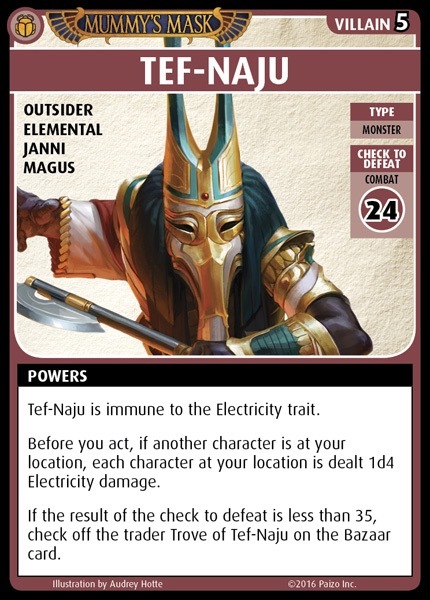 And Ptah knows how you're supposed to guarantee threading the needle in the pottery-littered Sculptors' Lair. Even your allies don't let you get away with bashing about unchecked. 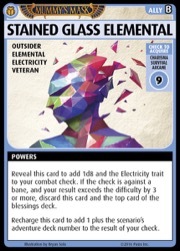 The Stained Glass Elemental shatters at a moment's notice, taking the top card of the blessings deck with it. Good news! If you close the unstable Sculptors' Lair, you can get an equally unstable Stained Glass Elemental. 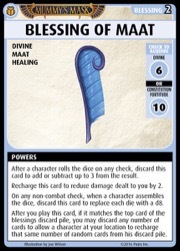 We've offered up several banes that care about the number you roll. 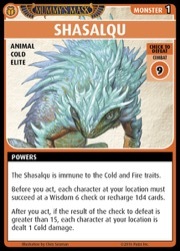 The Shasalqu will freeze you with cold if you hit it too hard. The Thriae Soldier will sting you with poison. 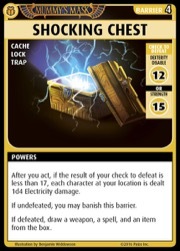 The Shocking Chest will zort you with electricity. The Yellow Jelly will scorch you with acid. We expect you will fall prey to all those elements at one point or another. I admit I am not sure how to pronounce "Shasalqu." Henchmen and villains get in on this act. 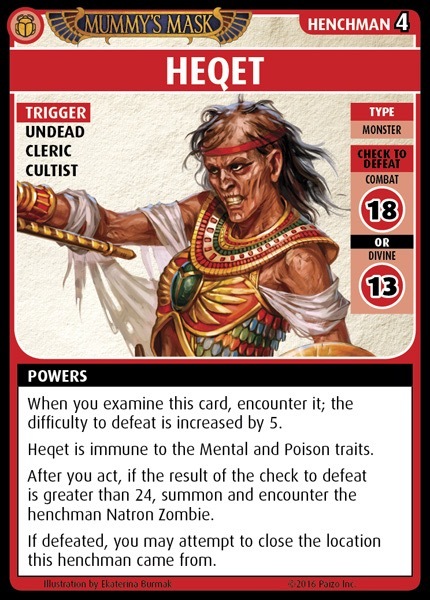 If you overroll, the henchman Neqet won't bother damaging you himself; instead, he'll call a zombie buddy to rough you up. In Adventure Deck 4, the villain Half-Fiend Sphinx and the henchmen Userib and Cultist of Areshkagal damage you if you are too overbearing. 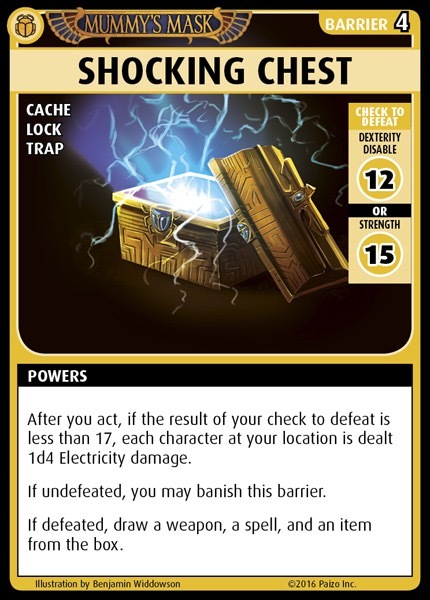 The Mining Construct goes the other way, offering you an item if you defeat it by 5 or less. 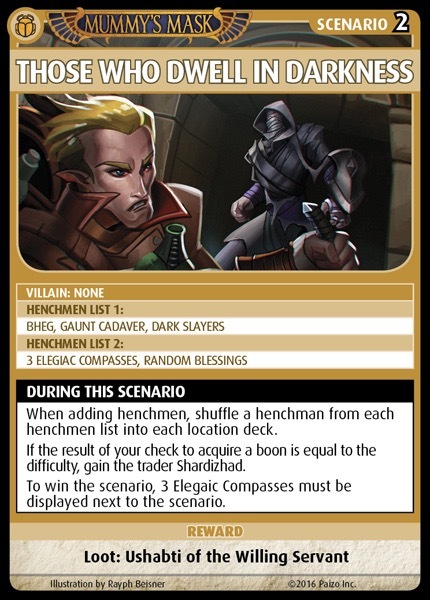 The henchmen in the delightfully named scenario Tomb Raiders Gone Rogue are particularly touchy. Most raiders let you attempt to close your location only when you defeat them by less than 5; otherwise, you've got a lot more exploring to do. But if you do hit under their threshold, you can get a bunch of boons, so moderating your thuggery can pay off in the tombs. Hmmm. 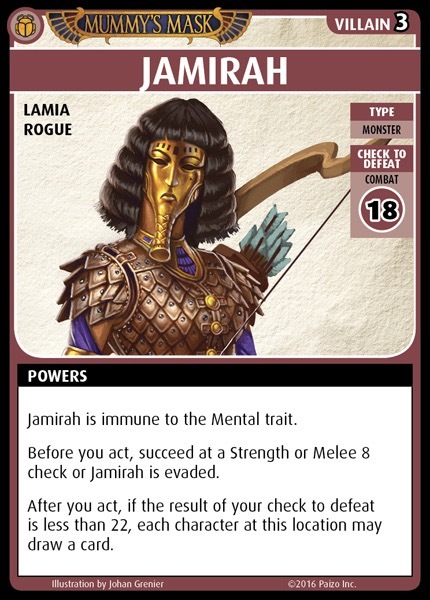 I wonder if she's related to the Wrath of the Righteous villain Shamira? 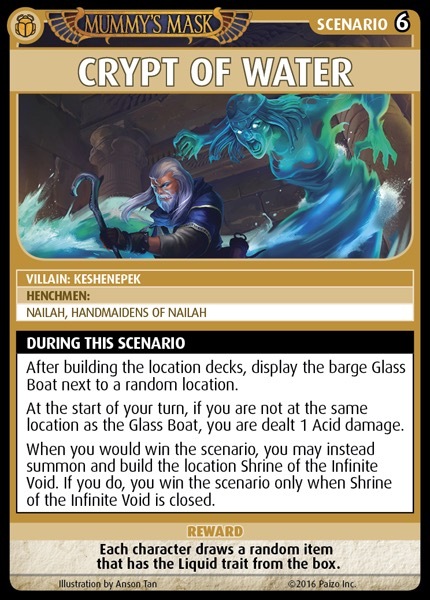 Debuting in Adventure Deck 6 is the Glass Boat, the first and only instance of a new type of support card called a barge. When you're in the boat (and the scenario Crypt of Water will make you want to be), being very precise can get you a free Alchemical or Liquid item. Being a lumbering ox means no potion for you. Fear not, though! We've provided several new ways to get those numbers where you want them. Obviously, there are lots of ways to add static numbers to your checks. 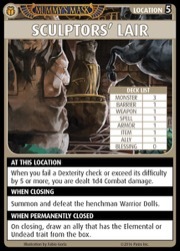 Reducing the number of dice you roll while increasing the static number you add will stabilize your roll, giving you some control over your result. You can't beat the ability to adjust your number after you roll. We highly recommend shifting your object of worship to the law deity Maat. 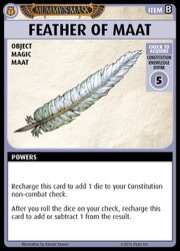 A Feather of Maat is a Luckstone that runs both ways, and the later Effigy of Maat gives you even more versatility. 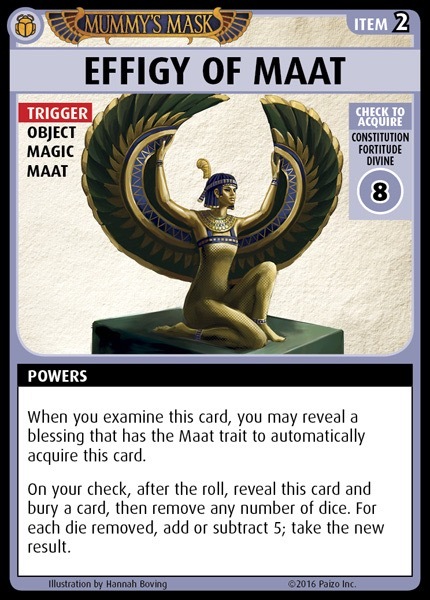 The Blessing of Maat not only allows you to add or subtract 3, but even change all your dice to d8s if that's what you need. 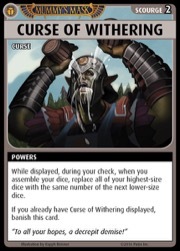 Who ever thought that you'd like seeing the word "subtract" on a card? Maat did. 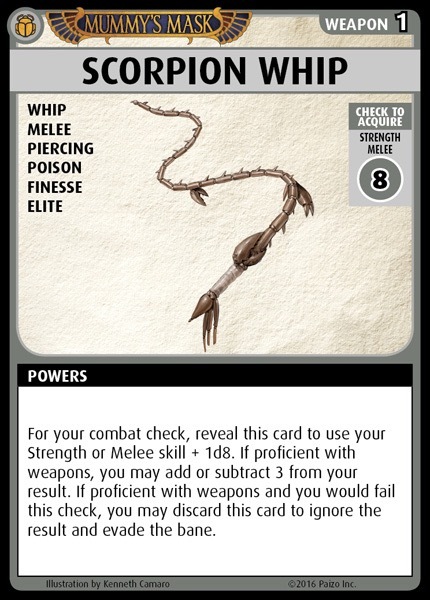 You melee types might want to pick up the Scorpion Whip. 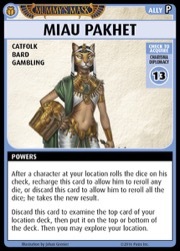 Any spellcaster can pick up the Symbol of Fortune, which will add or subtract 3 after the roll. The loot item Tablet of Languages Lost is good for adding to or subtracting from your Charisma check, especially if you're playing a Sorcerer blasting your way through the catacombs; so's the Silken Ceremonial Armor. 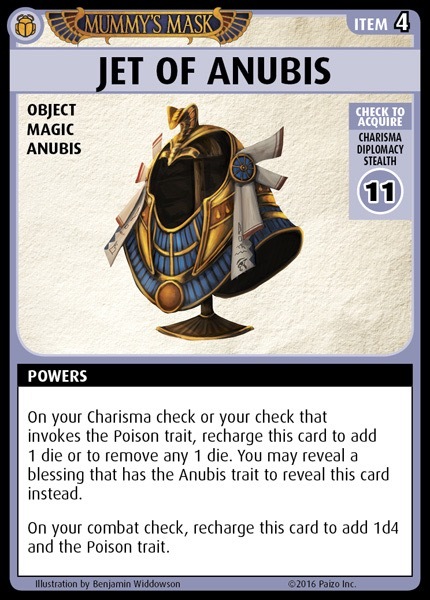 The item Jet of Anubis can either add or remove a whole die. Trust me, you haven't lived till you remove the 12 you rolled on your d12. Similarly, the Blessing of the Lady of Graves lets you roll your Wisdom die and subtract it from your result. I can't play Symbol of Fortune without imitating a game show audience. Meanwhile, the promo ally Miau Pakhet lets anyone at your location reroll a die, which is quite useful when you need to be precise. Plus that second power is nothing to flick your tail at. Dude, you have weird friends. Then there are the more unhinged decisions you can make. If your party has a Remove Curse spell (or if you're Alahazra), you could even pick up a Curse of Withering. 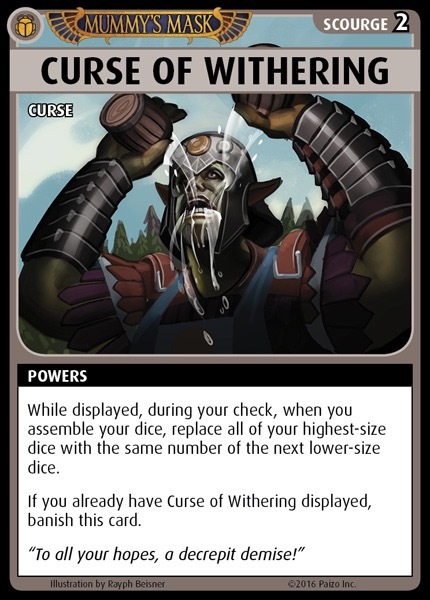 Replacing all your dice with lower-size dice can keep those high numbers under control. 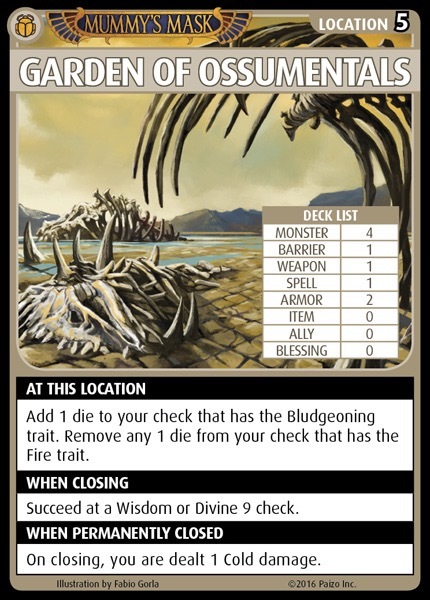 If you're in the Garden of Ossumentals, consider adding the Bludgeoning or Fire trait—or both! The first can add a die, and the second can remove one. You can even add two numbers to the roll in the Garden, if you roll two different doubles. 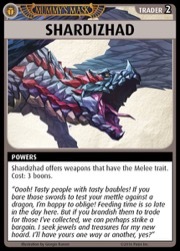 Hey, speaking of dragons, there's our favorite—and what might be your least favorite—use of precision in the whole game. 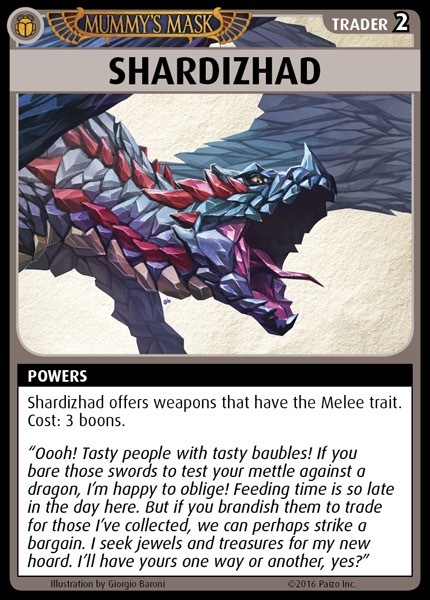 Just like the villain Tef-Naju giving you his Trove only if you roll 35 or less to defeat him, the dragon trader Shardizhad is not impressed easily. She will only trade with you if the result of your check to acquire a boon is exactly equal to the difficulty of acquiring it. Yup, it must be bang-on. 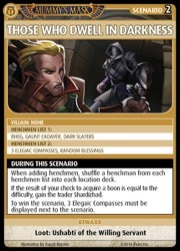 If you don't do it, you might be tempted to lose the scenario to get that ability to trade for Melee weapons. You're about to find out how hard is it to NOT display 3 Elegiac Compasses. Those are the precise ways you can handle the precision mechanic. 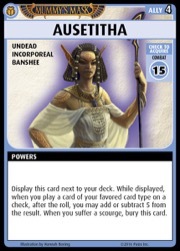 Good luck with that, and we hope you enjoy the epic conclusion of Mummy's Mask, which we'll preview next week! 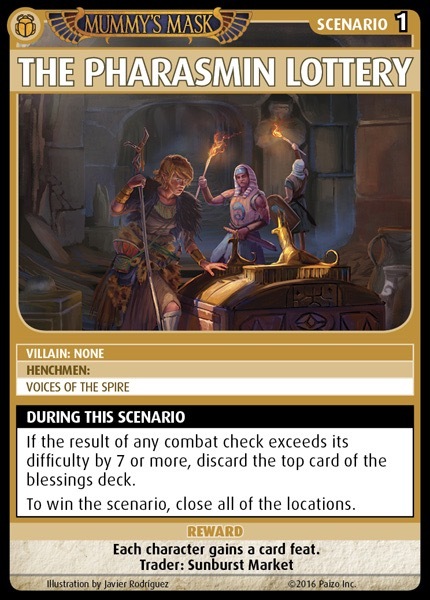 My group has found the precision aspect of this AP to be a very refreshing addition to the system, something that creates a whole new layer of complexity and tactics for attempting checks. 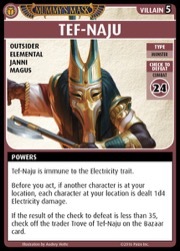 For me, this has been the most interesting new element in the game series. If you don't do it, you might be tempted to lose the scenario to get that ability to trade for Melee weapons. you can just play PFSACG, and get it without any special tactics. 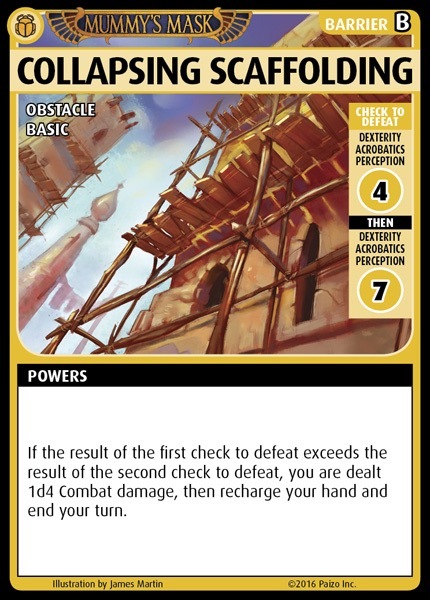 Having run afoul of more than a few collapsing scaffoldings (and checking the image twice before posting this just in case), I am fairly sure that the blog has it reversed: you want to roll higher on the second check, which still incentivizes you to do intriguing things like not roll your best skill on the first check (after all, you still will probably hit a 4 with something like 1d8 or even 50% chance with a 1d6 and nothing bad happens if you fail the check other than shuffling the barrier back in, whereas beating both checks and rolling higher on check 1 could be much more painful). 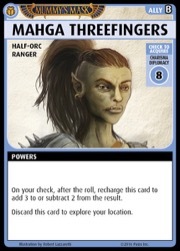 My wife and I are fond of rolling Acrobatics or Perception on the first check, whichever we don't have for the d4, then using our best skill for the second. 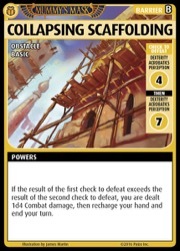 We shuffle a lot of collapsing scaffolding back into the deck. We got him on some throwaway spell neither of us wanted, but my wife had a d6 Int against a 6 difficulty and got it. I thought getting exact numbers (or within a certain range) would be more common in this set. We figured we could get away with the exact-number trick only once before the mob revolted. The whole point is that in many case you can manage to select a skill you don't have in order to roll d4s, thus having a pretty good control on your exact result if you have the required powers/cards to add/remove dice or values after the roll. 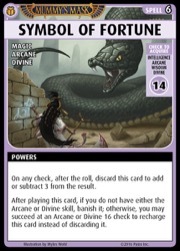 But then, just play Ahmotep (Eldritch Scion) with a bunch of gambling items, blessing of Maat and special allies and the true concept of failing a roll goes into Oblivion. Wait, why are they laughing at Magha Threefingers? Wow... If I read it well anytime a character evades a bane in the Glass Boat, he gets some booze. Hide that blog immediately! If my friends read that I'm doomed, they gonna empty the box of every drinkable items!!! It's gonna be an Osirion's Hell of a hangover. 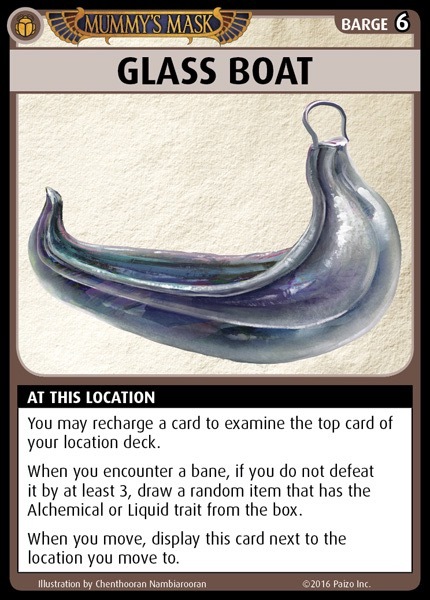 My point: Glass Boat doesn't say "When you defeat a bane,..." but "When you encounter a bane,...". So the bounty comes even if you fail to defeat, or not defeat at all. Sure, but all those banes you're not defeating are going right back into the location deck, while time keeps ticking away. 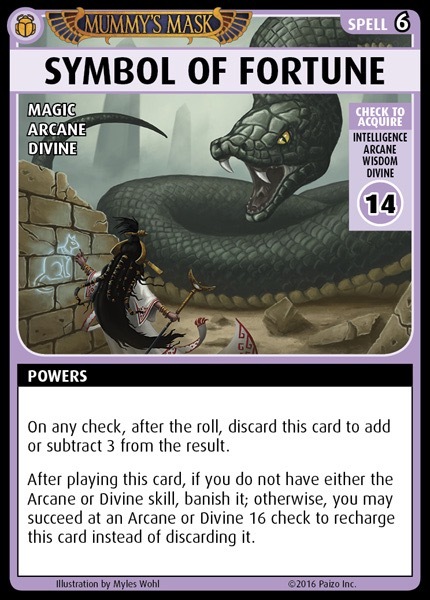 And check out that scenario text: "When you would win the scenario, you may instead summon and build the location Shrine of the Infinite Void. 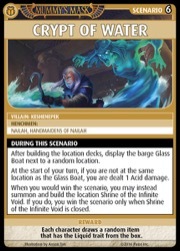 If you do, you win the scenario only when Shrine of the Infinite Void is closed." I'm not going to spill on exactly what Shrine of the Infinite Void is yet, or why you would want to give yourself more to do, but I will say that the Shrine will take you longer to get through than most locations, yet Crypt of Water begins with the standard number of locations in play. Putting this into a Wrath of the Righteous context, this scenario could be called "Temptation of Spirits." 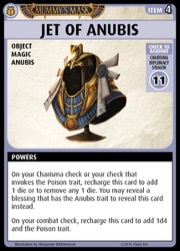 Post-blog, I find the Jet of Anubis and Garden of Ossumentals wording to be quite counter-intuitive and/or misleading. 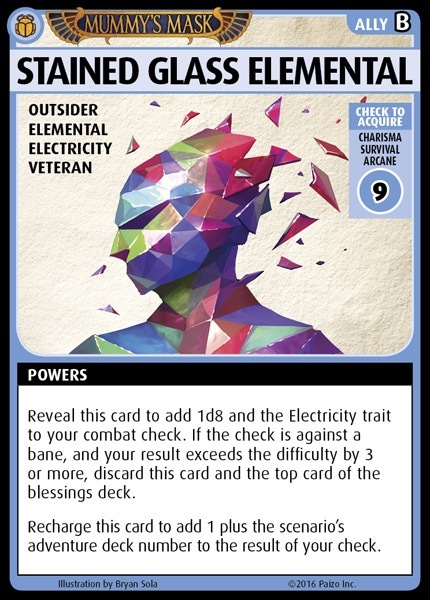 Perhaps due to their first powers ("on your check...add 1 die" and "add 1 die to your check", respectively), I was under the impression that their second powers ("on your check...remove any 1 die" -this being even in the same sentence as the ADD 1 DIE power- and "remove any 1 die from your check") are ALSO played in the Modify Your Check step, and not *AFTER* the dice have been rolled and result has been determined (as implied by the "you haven't lived till you remove the 12 you rolled on your d12"). I would personally never have guessed that is the purpose of the current wording. 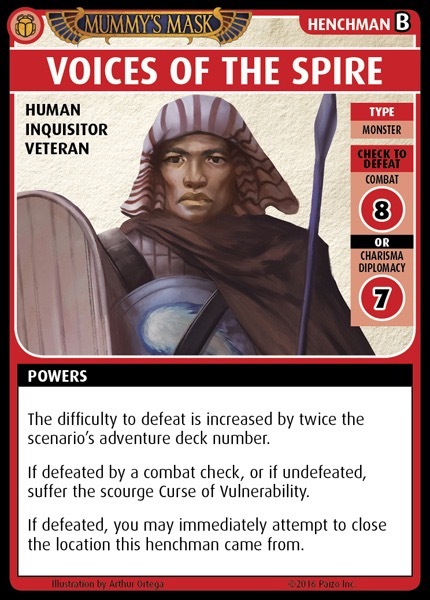 I believe if that is the intent, those cards will be better served by a FAQ along the lines of "remove any 1 die from the check's result" - unless I'm really missing a rule that should've made the intended reading obvious. Wow I didn't even notice that! 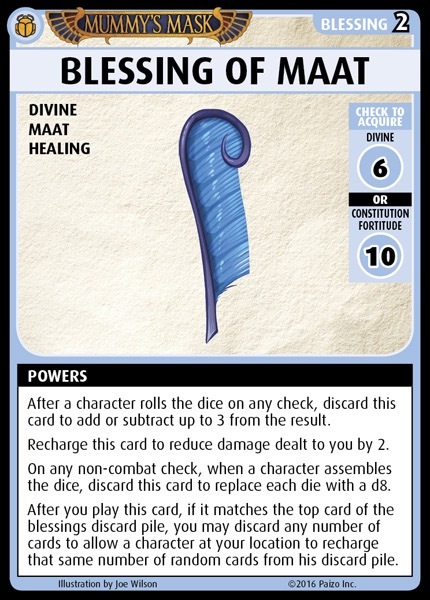 I assumed that all adding and removing of dice happened BEFORE you rolled (like you said) unless stated otherwise (as in Maat: "after a character rolls the dice on any check"). 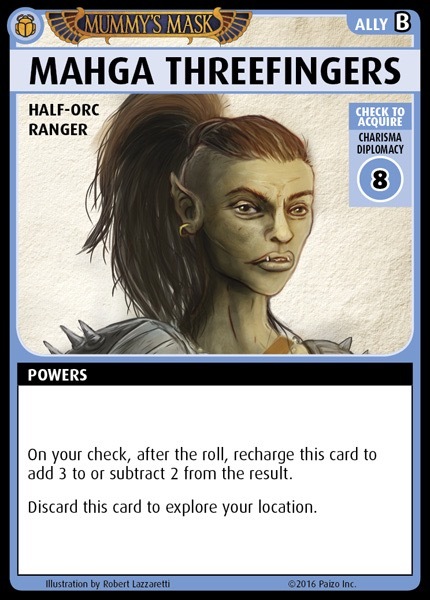 I agree that the text on the cards makes it seem like you have to remove dice before you roll, but when you think about gameplay-wise, that's a super niche ability. 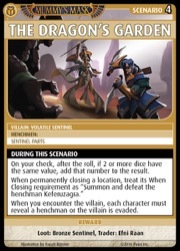 Usually if you want less dice you just don't play the cards that add them. I agree it's niche, but still, as explained in the blog, sometimes I may want to add 2d4 to the check, and then remove the d12 from my base skill. 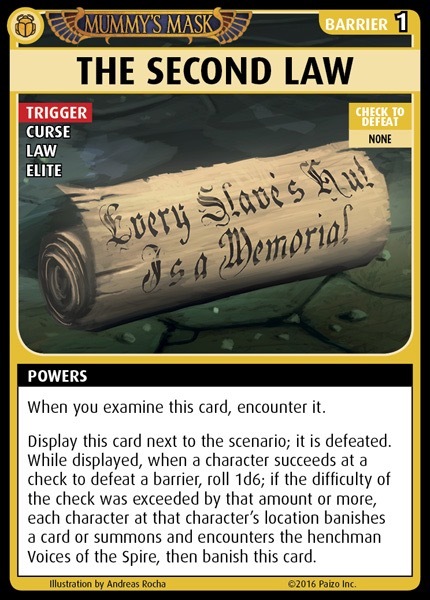 It's certainly one trick to hit narrow targets, and it's a perfectly legit assumption that this is what those cards mean with "remove a die from your check". At least this blog isn't about being precisely accurate or anything.